Doc Update! “Comics Are Everywhere!” Gets More Positive Ink & “King Star King” Finds an Audience! 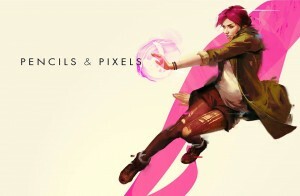 : COMICS ARE EVERYWHERE! Doc Update! “Comics Are Everywhere!” Gets More Positive Ink & “King Star King” Finds an Audience! Finally! A quick Fall 2014 update on the much-anticipated, documentary-in-progress, Comics Are Everywhere! Recently, the documentary received more media coverage, which helps to raise awareness about the project. This time, the positive ink was courtesy of Southwestern Sun, the award-winning campus newspaper at Southwestern Community College. Old-school storyboard art shared exhibition space with concept art from state-of-the-art video games courtesy of Sony Computer Entertainment at the Southwestern Art Gallery's Fall 2014 art exhibition Pencils & Pixels, co-curated by artists Vallo Riberto and Neil Kendricks. SWC arts editor Gabriel Sandoval’s smart and well-written article is one of the most in-depth pieces on the documentary to hit newsstands and the Internet in recent memory. And the timing of Sandoval’s article couldn’t have been more perfect since it was released in tandem with the exhibition Pencils & Pixels, a group exhibition that I co-curated with my SWC colleague and artist friend Vallo Riberto, the gallery director of the campus art gallery. JJV's animated brainchild King Star King runs wonderfully amok on the Cartoon Network's Adult Swim lineup, but you have to catch the bizarre KSK mayhem on the late night and early, crack-of-dawn programming on Adult Swim. 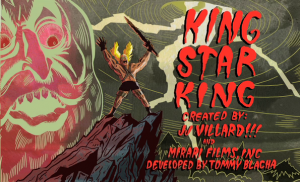 Back in June 2014, JJ Villard’s original, animated TV series King Star King debuted as the Cartoon Network’s first online animated series. Working diligently behind the viewfinder of my new Canon C-100 camera, I filmed the show’s premiere party at Titmouse Animation Studio where JJV held court donning a wicked Micky Mouse mask complete with a ghetto-fabulous grill. Somewhere, the ghost of Walt Disney is spinning in his grave at the spectacle of this brilliant Cal Arts alum who is making rowdy waves in the animation world. As the director of Comics Are Everywhere! I was ecstatic to see JJV’s passion project come to fruition. Here is a link to KSK‘s roughly 11-minute, pilot episode, bursting at the seams with JJV’s signature, art-damaged surrealism laced with raunchy humor for your viewing pleasure (or displeasure) depending on your point of view. Squeamish viewers might want to think twice. However, if you are an open-minded soul who is eager to get an intimate glimpse into the mind’s eye of a skilled animator weaned on comics and crazed ideas, this mind-bending dreamscape where the id reigns supreme, King Star King is for you! With some much-needed luck, I am hoping to get JJV on camera again in the near future. Danni Shinya Luo's elegant self-portrait Ego was among the numerous, stunning artworks featured in the talented artist's last solo art exhibition at La Luz De Jesus Art Gallery. 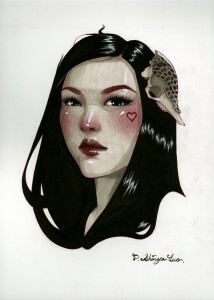 Congratulations to artist extraordinaire Danni Shinya Luo – who shares the spotlight with JJV as the doc’s main female character – who is getting married to her wonderful beau, Randy Niu, next Saturday, November 8. Talk about an amazing, new chapter in the life of an amazing artist who is one of the most genuinely kind and considerate people I’ve been blessed to meet and call a friend. The creators of Comics Are Everywhere! want to wish only the greatest happiness and prosperity for Shinya and Randy on their new, shared adventure as husband and wife bravely moving forward into the future, their great passion and enduring love for one another as the perfect compass! Next weekend, I will be making the trek to Santa Cruz to see these wonderful folks tie the knot in style! In the coming months, I hope to make more updates with more frequency. At least, that’s the plan! During the past year, I’ve been extremely busy writing grants in my ongoing search to secure the necessary funds for editing, animation and other post-production costs. In addition to the marathon grant-writing sessions, I am simultaneously juggling teaching commitments and developing a new, experimental video project titled Memory Lines: The Wailing Wall, which is being commissioned by ArtPower! at UC San Diego. This October, I applied for Cal Humanities’ California Documentary Project’s much-coveted production grant and I am plan to throw my hat back into the grant-writing fray again for ITVS’ open call for independent producers and other grant opportunities as they present themselves. I’ll keep all of you posted as the production phase of this ambitious indie documentary that follows the beat of a different drummer slowly inches toward completion with animation work and more editing to follow. Thanks for your ongoing patience and understanding. Peace out, my loyal peeps, both on and off of the Web! The indie filmmaking adventure that is Comics Are Everywhere! continues! Stay tuned tuned for more news from headquarters at Comics Are Everywhere! to come in the near future!